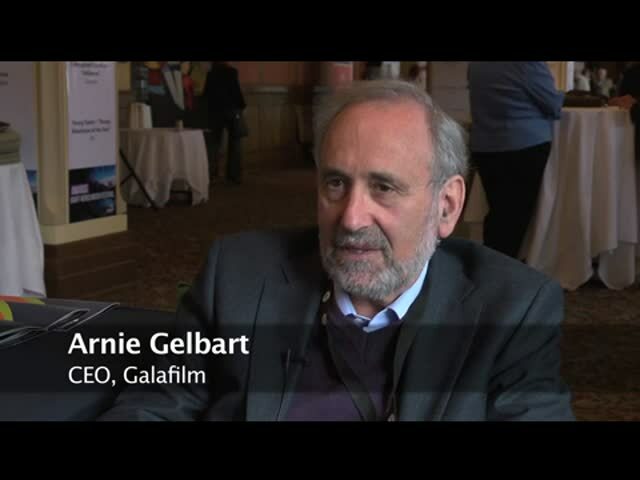 My name is Arnie Gelbart. For 21 years, I have run a production company in Montréal called Gala Film, but I have been a producer for about 30 years. I started doing feature films and then moved into documentary. The company has been doing large documentaries and documentary series as well as television drama, feature films and children's programming. So we have done a bit of everything. Fraser. You received a wonderful award here yesterday at the Banff television Festival. Tell us a bit about how you felt about that. Gelbart. Well, as long as it’s not a lifetime achievement award…. If it was going to be that, I was going to refuse it. Some days I feel like giving up; other days I feel like I'm just starting out. So I'd rather feel like I'm just starting out, with new challenges. It was an award for being an innovative producer. Our company has been involved in many genres, and we got into multimedia quite early, in 1996. The technology didn’t really exist then, but I was wasting money on it already! We have done many controversial things, sometimes dealing with difficult subjects; but our company feels it's important to keep doing these things. It's much harder now than it used to be in terms of the funders and what they are broadcasting. F. What got you started in the feature film? G. I was always interested in film. When I was eight, I wanted to have a movie projector. So, I guess it goes back a long way. But when I started in architecture at McGill, rather than writing papers, I started making films about buildings and the urban landscape. After school, I got involved with filmmakers in Québec… with Claude Jutras when he was starting with his feature films and with Gilles Carle. After working in feature films in Canada for awhile, I went to Europe, where I was an assistant to Luis Bunuel for several years. When I came back to Canada, I started a production company. It was easier to do documentaries than feature films at that time. But I've always kept a real interest in feature films. They are wonderful when they are good. So we continued doing feature films and have had some success with them; we have one coming out this year. F. People say that, in order to make feature films in Canada, you have to have a great passion for telling stories. G. Yes, you do have to have passion for it. But, because we live next to the United States, there is a huge issue with all of the American material. And the infrastructure of the theatre ownership has always been a problem. And, in English Canada, I don't think we've been brave enough to create our own internal audience the way people in Québec have. In television, instead of nurturing Canadian programs, the Canadian broadcast system has found it expedient and financially rewarding to import American programs. So, we have never created our own indigenous appetite for Canadian content. The same holds true for feature films: only the more difficult feature films are made, the very auteur things, films that the Americans would not bother making. That limits the audience. We have not nurtured a mass audience, but have encouraged a kind of filmmaking that is a very marginal and elite in some ways, or sexually courageous in others. Really, there is no reason why Canadians cannot be as original in their filmmaking as Australians or anyone else. Another problem with being next to the United States is having our best people go south where the opportunities are. Many of the Canadians in the United States would like to come back here because they can do films in Canada that they cannot do south of the border; films that they are passionate about. F. Norman Jewison has been very candid about these issues as well. G. Yes, in a different way, he was saying what I am saying; that's why he created the Canadian Centre for Advances Film Studies because he felt we could make good movies here, but that we needed to nurture the talent, the kind of storytelling that we had not nurtured before. I think the school is a big success and will continue to be so. F. You have alluded to the fact that you cannot make movies in Canada without government support. Do you think governments have missed the boat in supporting the industry? G. If the comparison is the US, we don’t have an argument. Every national cinematography in the world has government support, either directly (and far more significant than anything we've ever had), or structurally with such measures as quotas. So when people say that Canadian filmmaking is only possible with government support, the whole world uses government support… except for the US, because they have such a vast monopolistic industry. They had a head start on everything and they control distribution. But, if you go to any country in the world including the emerging nations in Eastern Europe, or Asia, all of those industries have significant government support. Only Canadians are made to feel guilty about it and that's not fair. F. What should we do? G. I think we need to encourage more filmmaking at higher budgets. Filmmakers never know what the result will be from their films. You make your best guess and hope the audience finds your movie. But, you need to make a lot of movies in order for a few to be successful. I know Québec is held up a sort of cultural example. It’s supposed to be a small, cultural ghetto that is protected by language. But there is more than culture going on in Quebec. There is an attitude of risk-taking. For example, the Cirque du Soleil did not happen without government help. People think that this great commercial enterprise just happened; but, if Rene Levesque had not given them millions of dollars when they started out and were about to collapse, there wouldn’t be any Cirque du Soleil now. There is much less guilt in Québec about taking government support, because that relationship is part of the matrix of society. They understand that creating a culture sows the seed for further culture, and that filmmaking is not just about creating an industry.